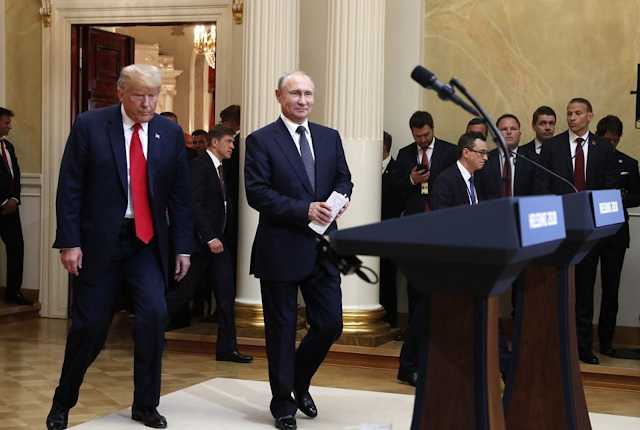 Putin looks like a Wizard, and Trump his Golem (soulless zombie) servant. Naturally I am not suggesting that this is *actually* the case, only that it *looks* that way in the picture. The Golem servant is a well known concept going back to late-medieval magical lore, and like Frankenstein is always depicted as lurching. But what can we say about Marcion then? (referencing your previous post) For me the study of early Christian religious forms has always been about justice. Who gets to define how history is written. Who speaks for earliest Christianity? Do we just let the powerful write the epitaph of the vanquished? When did the battle end? Why can't it be decided today? Yes it's not entirely satisfactory - working out the problem in your head. It would be better to have incontrovertible evidence. But we're going to die anyway. All life is just mental musing. Not like this subject matters anyway. I just go through all of this because I hope to find something beautiful hiding in the long grass. Maybe it will come down to symmetry. Whether Jesus or his Father is the good God matters. Why? Because the Church Fathers didn't want us to see it. What the heretics actually believed is the ultimate occultation. I suspect it was beautiful. No I don't think you will get everyone to agree on the answer. But you know good music when you hear it. Jesus can't have been the good God. Mark displays his anger - and it was removed. The anger was there for a reason and it was taken away for a reason. I think Jesus was Yahweh. That's what Tertullian says over and over again. Did the Marcionites disagree? I don't think so. ...then you are the same guy who doesn't derive the logical conclusion from the premise: that this Jesus has to suppose necessarily, as polemical target, a religion that saw Yahweh as a god totally unable to be redeemed. 3) therefore: the Gospel is apology against who attacked the creator. But then you will say that I have no evidence of this, etc, etc. Who was Jesus if the Father was the good god? 5. the myth or fable or story or whatever you want to call it came from Philo to Christianity. 8. while the controversies in the late second century were varied one strong bone of contention which emerges by the third century and down through Nicaea and beyond is the difference between 'Son' and 'Father.' By the time of the Nicene orthodoxy a pronounced effort was made to effective neuter the question with questionable use of language. On the one hand the Alexandrian tradition seemed to recognize and emphasize the inferiority (subordination) of the Son. Efforts from outside of Alexandria wanted to prevent or obscure this knowledge. Back in the late second century the question of whether the Father was on the Cross is intimately connected with the 'who is the good god' the Father or Son discussion we are having. Admittedly the evidence gets more questionable as we go down the list. But when you read the writings of the Church Father there is this common interest in the 'good god' among the heretics. That's why they all take such interest in Mark chapter 10's - 'no one is good but the Father' - which seems to imply (a) a common use of Mark and (b) the idea that Jesus wasn't the good god. The people talking about 'the good god' who is a stranger or unknown to the Jews is (according to the metaphor) the feet of the elephant. The people talking about the Father suffering on the Cross the trunk. And so on. There was a common understanding ultimately where the Father was the good god and Jesus was someone else - presumably the just god for lack of a better guess. That's why they all take such interest in Mark chapter 10's - 'no one is good but the Father' - which seems to imply (a) a common use of Mark and (b) the idea that Jesus wasn't the good god. (c) the presence of people who denied that the Father in question was good. But the Father in question is the creator in the Gospel. The orthodox were attempting to neutralize and transform the Alexandrian tradition. This is why there were heresiologists. Instead of saying 'there was this tradition which came before us which was offensive to the powers of the world and which we swore to change on their behalf' the Church Fathers made it seem as if each famous teacher represented a separate 'sect' (= heresy) while they maintained the original tradition from the apostles. In reality though the heretics derived their origin from the tradition of Mark at Alexandria which explains why (a) the Alexandrian tradition is never mentioned much in Acts and (b) why the Gospel of Mark is never used or at least no commentaries are ever written on the gospel of Mark. Mark was a bad (heretical) gospel. (c) the presence of people who denied that the Father in question was good. Please give me names or examples from primary sources in antiquity. I have read a lot. Don't know of these heretics. I find it surprising that this would be so given my erudition. Enlighten me.